Add True Fitness to your favourites! Get into shape in no time at True Fitness centres, where you'd find state-of-the-art fitness facilities and a wide variety of classes ranging from yoga to spinning. There are eight True Fitness locations in Singapore, close to where you live and work. 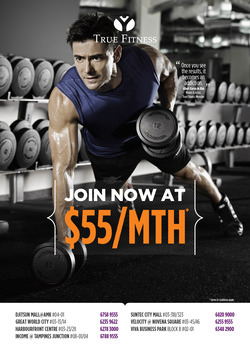 Interested in getting a True Fitness membership? Go online to find out more and to sign up for a free trial. Want to get serious about your fitness? True Fitness also offers a range of personal training classes so you get the utmost attention. True Fitness was first established in late 2004 in Singapore by Founder and Group CEO Mr Patrick Wee. Today, True Fitnes has 35 centres across five countries in Asia. Do you want to receive more offers from True Fitness by email?